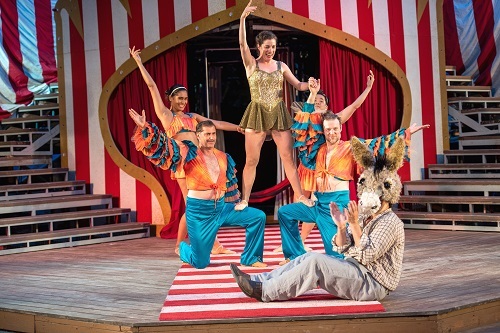 The production of A Midsummer Night’s Dream at this year’s Shakespeare in High Park—currently running at the High Park Amphitheatre—is a straightforward adaptation of the classic play that sets itself apart with the high volume and calibre of comedy the cast is able to maintain. The story, like most of Shakespeare’s comedies, focuses on competing love interests and the question of who will marry who by the end. Throw in some magic, the fairies that wield it, and one of the more memorable examples of a play-within-a-play, and that’s pretty much all the setup you need. Director Tanja Jacobs’ vision for the play is to change it from within, integrating jokes into characters’ existing personalities rather than over-weighing them with some overarching modernized touch for its own sake. Think of Puck (Peter Fernandes) storing things in his pants, or Titania (Naomi Wright) and her deep need to dance throughout her day. Their habits are not only funny but also insightful into their senses of selves, a combination that builds endearment as the action progresses. Jason Cadieux embodies both Oberon and Bottom like they’re connoisseurs of life trained to savour all they do. He does well to thread a thin line of vulnerability through his authoritative, full-flavour performances–just enough to remind us his characters are flesh and blood like the rest of us. Rachel Cairns leaves it all on stage as the unfiltered Helena, imbuing her with gestural brilliance a la Lucille Ball and a pathological honesty. I found myself rooting with her for the world to return in kind, even though I knew it wouldn’t. Peter Fernandes, meanwhile, plays Puck with a mischievous joy that propels the story along with undeterred enthusiasm. The hijinks he orchestrates demonstrates the benefits of occasional chaos–it keeps you on your toes–especially if one finds one’s head replaced with a donkey’s. My guest, Sebastian, gave all credit to the performers and their impeccable timing for not letting more than a few moments pass without subverting his expectations. They achieve this by bringing dignity back to the value of a single gesture. Imagine the mileage Demetrius (Jakob Ehman) gets out of a matador pose, or Flute (Mac Fyfe) gets out of his death scene as Thisbe. The critical thought that went into building up these small moments into fully-formed comedy bits is omnipresent. Here we have a reimagining of a classic that relies on acting fundamentals to go about its business. It finds considerable sophistication in this, in the efficiency of generating all its wonder from voices and bodies we are given every reason to feel for. The production is relevant because it highlights the fickleness of love in a way that doesn’t deter you from wanting to feel it. A thorough delight. A Midsummer Night’s Dream is playing until September 2 at High Park Amphitheatre (1873 Bloor Street West). Performances are at 8:00 pm on Wednesday, Friday, and Sunday. Tickets are pay-what-you-can or $25 for reserved seats. They can be purchased online. Photo of Navtej Sandhu, Gordon Bolan, Naomi Wright, Frank Chung, Mac Fyfe and Jason Cadieux by Dahlia Katz.